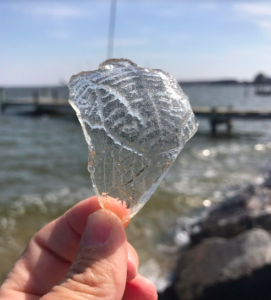 The prompt on the #beachphotochallenge today is “broken” and this is supposed to be a photo caption but it was too long for Instagram so here we are. I decided to post a selfie. I hate selfies. I mean I really, really hate them. I probably post one a year. I don’t really want to go into reasons for this- I mean I don’t want to insult people who post a lot of them, but I guess it probably has more to do with me than them, and at a minimum with the fact that I never have my hair or makeup done. I have self-esteem issues, ugh that sounds whiny, but it is true. Even in this photo I am posting, I see my exhaustion. I struggle with anxiety and depression. Mental health issues are no stranger in my family. Since I started the SeaCrate business, I have struggled with an incredible amount of stress. 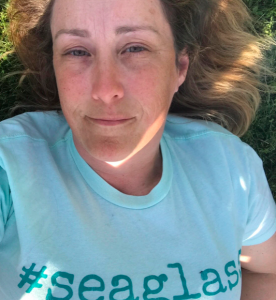 It was a small idea- start a business to share sea glass with people because I couldn’t afford the postage for all the sea glass I was mailing- and the idea, the business, got bigger than I originally hoped, but I didn’t really have the business background to handle it. I’m a lifelong journalist: writing and editing are what I do, not running an international company growing each month. The last year has taken its toll on me physically and beyond with a number of side effects regarding my health. Finding a business partner is a solution I am very thankful for, and starting with the June box I will be able to step into a role that will allow me to return to writing, and start to practice Reiki, which has been so helpful to me in recent years. I think our beach finds are symbolic of us as people. We can often be rough around the edges. We aren’t perfect. The years are like waves and they do soften the edges, but I still mess things up sometimes and every day I am learning. I’m still making my way, astonishingly trying to figure out what I want to be when I grow up even as I think about approaching age 50 next year. I need to learn to take better care of myself, to prioritize, to spend less time on social media. I want to feel like my life is in a good place to help others one on one in my reiki practice and I can’t do that if I am not taking care of me. But no worries you’ll see me start wearing makeup on non-sea glass show days either. I will still be all about embracing mediocrity and maintaining a reasonably low set of expectations in life so I’m never really disappointed, lol. P.S. March and April SeaCrates are available for sale at discounted rates at this link or you can order a May SeaCrate here until April 30.